The boys spent a few hours at their grandma's house this afternoon, so I busied myself by burning an intricate octopus stencil. I gave it a ton of little details, and was really pleased that the whole thing held together. It didn't work so well on the Gelli plate. The details were too small and the stencil film too thick to transfer the paint to the paper. I'd try again with thinner film, but it likely wouldn't hold up to all the octopus's thin contour lines. Maybe I should stick with carving stamps. 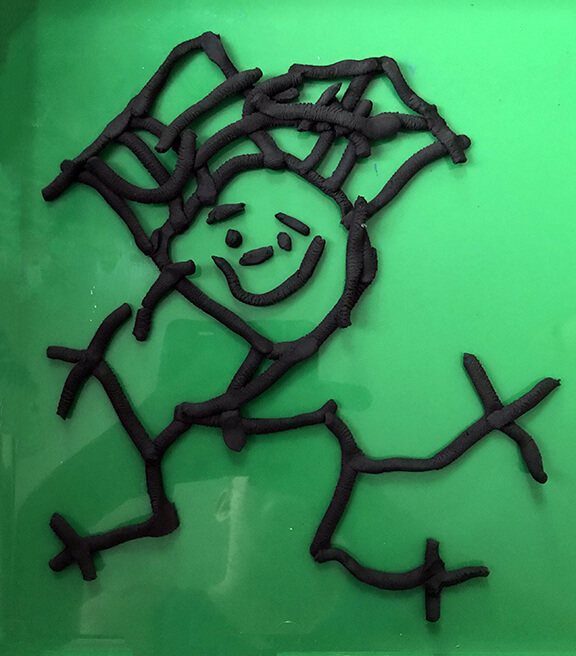 My four-year-old bested me, when he returned home, by creating a drawing out of Play-Doh. He used the pasta press to make himself some black lines, then arranged them on a tray.